Anilao, in the south of the province Batangas, has been a muck and macro diving paradise since the early seventies. Batangas is a province in the southwest of Luzon, Philippines and has become a thriving tourist destination, especially near Anilao and Mabini known for its sheltered coves, caves and healthy waters. 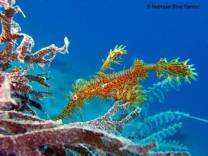 Anilao is one of the top scuba destinations in the Philippines, primary famous of its exceptional macro life such as nudibranches, ghost pipe fish, sea horses and mandarin fish. Highlights of this region besides its spectacular beaches and stunning underwater world are its natural surroundings and rich cultural heritage. You can visit Taal Volcano, one of the lowest volcanoes worldwide, sitting in the center of Taal Lake with a crater filled with water. The town Taal itself is a remnant of the Spanish colonial period when this region was flourishing especially seen in its knife craftsmanship. Views of the volcano are best in Tagaytay City, San Nicholas, Talisay and Laurel. There are many other things to do in Batangas. You can visit Mainit Hot Spring, experience the rich Tagalog Culture or explore Mabini Shrine found at Barrio Talaga in the town of Tanauan. Its steep forests are excellent places to take a look at waterfalls such as Tingga, Ilijan, Bulalacao and the Calicon Falls. Other touristic towns are Matabungkay, Punta Fuego and Laiya, all within easy reach from Anilao and within a few hours reach from the capital Manila. Hiking, kayaking, rock climbing, diving, snorkeling are just some of the popular activities. The coastline is cramped with resorts and cater mainly for scuba diving photographers. Unfortunately, this tourism has also resulted in over fishing, shell collecting and reduced healthiness of the dive sites reached from shore. Nowadays, best diving around Batangas is done around the islands of Sombrero and Maricaban and at the small town of Nasugbu. The water temperatures can be as low as 22 degrees, but nevertheless stunning and diverse in marine life. It is diving in caves, along steep walls, shallow coral slopes, with huge predators, macro marine life or in deep canyons. It is a well developed holiday destination full of entertainment, nightlife, bars, restaurants and other tourist facilities. Swim and dive with gentle giant whale shark and oceanic manta ray in Donsol and Ticao (Legaspi City), Bicol, Philippines. If you're not under the water, you can try our river kayakking, mountain trekking in the majestic mountain of Mayon and firelfy watching.